Tax season is here! Make your appointment now! Some California businesses required to file use tax returns. New Form 1099-K is essential tax document for businesses. Schedule D radically changed for 2011 individual taxes. Watch the foreign account â€œboxâ€� on Schedule B. Separate FBAR required for disregarded entities. New form required for Foreign Financial Accounts. Consider using Use Tax Table for California tax returns. IRS offers another voluntary disclosure program. IRS says more high-income taxpayers are audited. New Kennedy â€œNo BSâ€� book released. How do I report margin account interest? 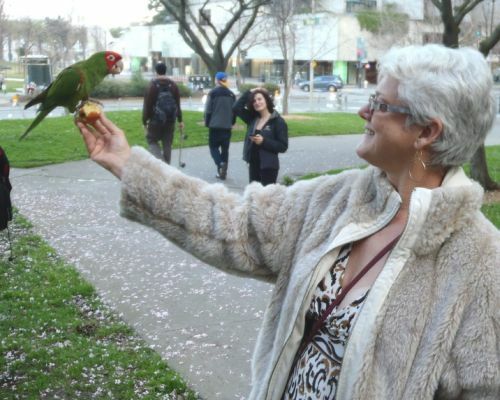 Here's Janet with a â€œparrot of Telegraph Hillâ€� in San Francisco. A flock of parrots was gobbling up plum blossoms and also enjoyed eating apple pieces. Valentine's Day falls on a Tuesday this year. Remember to express your appreciation to your loved ones! My daughter, Holly Baker, says MarchÃ© Aux Fleurs in Ross, California is already fully booked for Valentine's day. Hope you have already made reservations for your favorite restaurant. My grandson, Clive Baker, is celebrating his fourth birthday this month. Happy birthday, Clive! 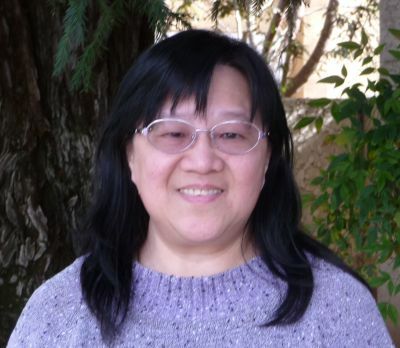 Phoebe Li, CPA has joined us for this tax season as a temporary worker. Phoebe has many years of experience, including as a tax accountant with BDO Siedman and as a controller with El Dorado Ventures. She came to the United States from Taiwan in 1977. Phoebe has a grown son and lives with her husband in San Jose. She enjoys reading Chinese literature. We are glad to have Phoebe with us! There are only about two and one-half months left before the tax return due date. Time to get started now! If we prepared your income tax returns last year, you should have already received instructions in the mail. If you haven't, please call Dawn Siemer at 408-918-3162. To have us prepare your income tax returns, start with the online Tax Notebook organizer. Call Dawn Siemer at 408-918-3162 for instructions to get started. We also have a paper organizer, if you prefer. We still need your documents (W-2s, 1099s, receipts for donations) to prepare your income tax returns. We have a secure internet portal for sending documents. Email Dawn Siemer at dgsiemer@taxtrimmers.com for instructions. We can prepare most income tax returns using information provided online and by mail. If you wish a personal meeting, please call Dawn Siemer at 408-918-3162 to schedule an appointment. Our calendar is filling up fast! Some California businesses are required to file use tax returns. California businesses that reported more than $100,000 in gross receipts from a business or rental property on their 2011 federal income tax returns and that don't file sales tax returns are required to electronically file a California use tax return for 2011. Businesses that registered with the State Board of Equalization last year should also file. Some businesses that reported no transactions for three years no longer need to file. The use tax returns and tax payments are due April 15, 2012. A use tax return must be filed even if there is no tax due. New Form 1099-K is an essential tax document for business tax returns. Merchant account (credit card) companies and payment services like PayPal are now required to report gross receipts processed for their customers on Form 1099-K. This information is required to be reported as a line item on business income tax forms. If you receive the form, be sure to give it to your tax return preparer. Schedule D (Capital Gains and Losses) radically changed for 2011 individual income tax returns. The IRS has issued a changed Form 1040, Schedule D and new Form 8949 for 2011. The forms are totally redesigned to accommodate information about the tax basis (cost to for tax gain or loss) of securities sold that is being reported by securities brokerage companies for securities purchased in 2011 forward. The forms require disclosure of adjustments to the reported cost and have many special codes. The tax basis reported by the securities brokerage company will occasionally be wrong and can be adjusted at column (g) of Form 8949. Separate Forms 8949 must be prepared with boxes checked for sales reported on Form 1099-B with basis reported to the IRS, sales reported on Form 1099-B without basis reported to the IRS, and other sales. In the past, the sale of a residence for which the gain was excluded wasn't reported on Schedule D. Now it's reported on Form 8949 with the exclusion entered as a negative number in column (g) and code â€œHâ€� in column (b). This form is sure to create headaches for 2011 income tax returns. Read the instructions carefully, even if you are providing information to a tax return preparer. You can find them under â€œforms and publicationsâ€� at www.irs.gov. In the past, the box at line 7a of Schedule B (Dividends and Interest Income) wasn't required to be checked â€œyesâ€� unless you had foreign bank and brokerage accounts exceeding $10,000. For 2011, the â€œyesâ€� box is required to be checked if you had any foreign bank or brokerage accounts, regardless of the balances. Please be aware of this change to avoid making an error, including the information provided to your tax return preparer. The IRS has updated its instructions for the Report of Foreign Bank and Financial Accounts (FBAR), Form TD F 90-22.1. New regulations were issued relating to the reporting requirements for these accounts during 2011. The form is filed separately from income tax returns for the reporting entity. The 2011 report is due June 30, 2012. No extension is available for the due date. The IRS has issued new Form 8938, Statement of Specified Foreign Financial Accounts, for 2011 income tax returns. This new form is required for 2011 for individuals only. It may be required for other types of entities in the future. Individuals required to file include U.S. citizens, aliens who are residents of the United States during the tax year, nonresident aliens who have elected to be treated as residents in order to file a joint income tax return, and nonresident aliens who are bone fide residents of American Samoa or Puerto Rico. Unmarried taxpayers and married taxpayers who file a separate income tax return and lived in the United States during 2011 are required to file if their specified foreign financial assets exceeded $50,000 on the last day of the tax year or $75,000 at any time during the tax year. Married taxpayers who file a joint income tax return and lived in the United States are required to file if their specified foreign financial assets exceeded $100,000 on the last day of the tax year or $150,000 at any time during the tax year. The filing thresholds are four times the above amounts if the taxpayer's tax home is in a foreign country and was present in a foreign country either the entire tax year or 330 full days during any period of 12 consecutive months that ends in the tax year being reported. The same information that is reported on the FBAR form will probably be reported on Form 8938. If the information is reported for a foreign trust on Form 3520, it's just indicated at Part IV of the form. This is another form for which you will want to study the instructions carefully, even if you are giving your information to a tax return preparer. You can find the form and instructions under â€œforms and publicationsâ€� at www.irs.gov. Consider using Use Tax Table for California individual income tax returns. The California tax authorities have a new program under which individuals can avoid scrutiny for possible California use tax liability for their online purchases. If the taxpayer meets certain requirements, reporting the Use Tax Table amount will be accepted without further question. The use tax table amount is based on adjusted gross income, and is fairly modest. In order to qualify to use the table, the taxpayer must not have made a single purchase subject to use tax of $1,000 or more. The IRS has announced it is offering another offshore voluntary disclosure program (OVDP) for taxpayers to get into compliance with the IRS tax and disclosure rules for foreign bank and investment accounts and foreign entities. The new program will be similar to the 2011 program, without an announced end date. The IRS says that they have collected about $4.4 billion from the 2009 and 2011 programs so far, and about 33,000 taxpayers have come forward to make voluntary disclosures. The details of the 2012 program haven't been released yet. Taxpayers may be required to pay a penalty of 27.5% of the highest aggregate balance during the eight tax years prior to the disclosure, but some taxpayers may be eligible for reduced penalties of 12.5% or 5%. According to the IRS, one in eight individuals with income over $1 million were audited in fiscal year 2011. The coverage rate increased from 8.36% in fiscal year 2010 to 12.48% in fiscal year 2011. The audit coverage rate for individuals with incomes $200,000 and higher increased from 3.1% in fiscal year 2010 to 3.93% in fiscal year 2011. New Kennedy â€œNo B.S.â€� book released. Dan Kennedy has issued No B.S. Grassroots Marketing for Local Businesses. The co-author, Jeff Slutsky, is hired by national chains to plug their local grassroots marketing holes. The book is written for local shops, stores, restaurants, professional practices, and service businesses. Dan advises business to business companies to give the book as a gift to customers that fit the profile. Readers of this newsletter know I am a big fan of Dan Kennedy and endorse all of his books. Monday at 4 p.m. and 7 p.m. Pacific Time on cable channel 19 in Morgan Hill. Broadcast on the internet at the same time as streaming video at www.mhat.tv. Tuesday at 4 p.m. and 7 p.m. Pacific Time on cable channel 19 in Morgan Hill. Broadcast on the internet at the same time as streaming video at www.mhat.tv. When I read the your online article, â€œThe Interest Expense For Your Margin Account May Not Be Tax Deductibleâ€�, I concluded my margin account interest is indeed tax deductible. If I understood correctly, you said the interest should be reported on Form 4952. However, it appears to me that Form 4952 is for interest relating to property, not stocks. If the interest should be reported on Form 4952, where should it be reported? In that article, I explained that interest paid for a margin account may be deductible in different places, depending on what the money was used for. Assuming the money was used for investment in securities other than tax-exempt securities, the interest is investment interest expense and should be reported on Form 4952. Stocks and bonds are considered to be property held for investment for this purpose.